These training workshops are designed to help therapists show clients how to recognize shame, work through it and move on. We will teach you how to become more sensitive to the shaming often implicit in the therapy situation and learn how to counter shame in therapy. You will learn how to help clients separate feelings of shame from other emotions. And you’ll learn how to take clients back to early shaming situations and reverse the outcome, helping clients move their energy powerfully outward rather than turn it against themselves. The Center for Healing Shame is approved by the California Association of Marriage and Family Therapists to sponsor continuing education for MFTs, LCSWs, LPCCs and LEPs in California - CAMFT Approved CE Provider #134393. PhDs in California and PhDs and licensed therapists outside California may be able to receive CE credits through the co-sponsorship of R. Cassidy Seminars. We also offer a full training program leading to certification as a Practitioner in the Healing Shame - Lyon/Rubin Method. "All therapists should attend your workshop. Truly—it was invaluable. Incredibly rich and unforgettable. I learned a tremendous amount and was spinning with excitement. It has already changed my practice. Your accessibility and authenticity made for the most invaluable learning for me. I really cannot thank you enough." "I highly recommend this work to EVERY therapist. 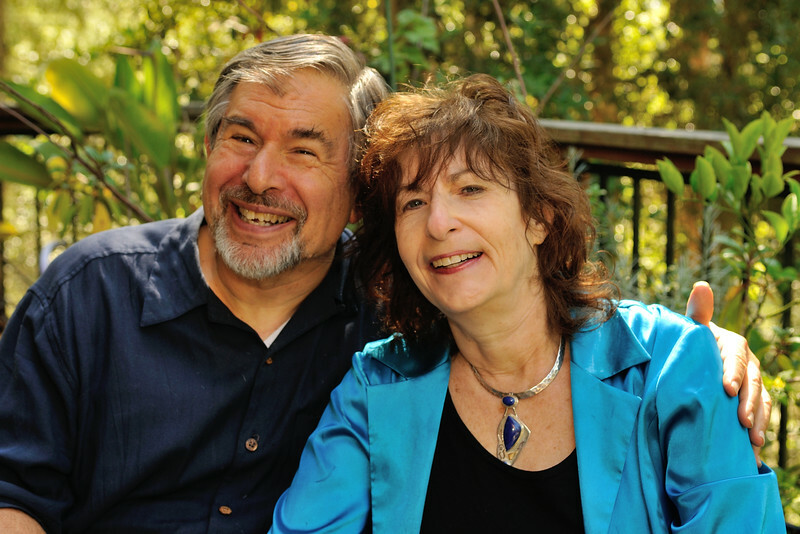 Bret and Sheila are brilliant together, well-grounded in research, hugely compassionate and safe, and AMAZING..."
Sheila Rubin and her husband, Bret Lyon, co-lead Healing Shame workshops in many cities in the U.S. and Canada, including New York, Portland, Oregon, Montreal, Ottawa and Victoria, B.C. They are based in Berkeley, California, where they offer workshops several times a year, as well as a full training program for therapists. They now offer workshops and training online as well. Sheila Rubin, MA, LMFT, RDT/BCT is a Marriage and Family Therapist, a Registered Drama Therapist and a Somatic Therapist. She has integrated somatic and expressive modalities with Emotionally Focused Therapy (EFT) to work with adults, couples, and children who have shame and trauma. She has trained in EFT with Sue Johnson, in AEDP with Diana Fosha, and in Hakomi with Ron Kurtz. She is adjunct faculty at the JFK University Somatic Psychology Program. She has been a healing professional for over 30 years. Bret Lyon, PhD, SEP, BCC has been a teacher of Somatic and Emotional Mindfulness for over 30 years and holds doctorate degrees in both Psychology and Drama. He is a Board Certified Coach, certified in Focusing and Somatic Experiencing®, and has trained in EFT with Sue Johnson, in AEDP with Diana Fosha and in Coherence Therapy with Bruce Ecker. Bret has also trained in Reichian Breathwork with Al Bauman, who worked directly with Wilhelm Reich. He finds his theater background very helpful with clients and especially in giving presentations. For more information, including descriptions and dates of each workshop, please click below to be taken to the Center for Healing Shame website.